Home | Ceramic Tea Cups & Mugs | Ceramic Coffee & Tea Mugs | Sushi Neta/Topping Mug 10 oz. 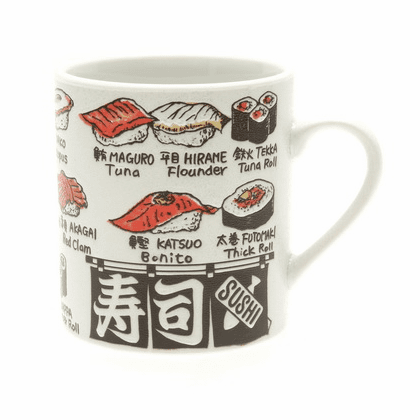 Ceramic mug with nigiri sushi topping and maki sushi design. Mug illustrating nigiri sushi topping and maki sushi with both English and Japanese translations. 3-1/8 inches in diameter, 3-1/2inches tall.